One of the things I've noticed eight years later after having my first child, I still have stretch marks. Now, they aren't as bad as they were when I was pregnant, but they are still there. 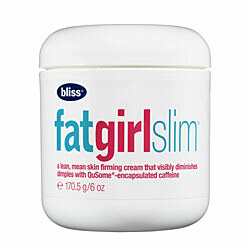 I was recently introduced to Fat Girl Slim from Bliss. Now, before you ask, NO, this cream does not help you loose weight whatsoever. Sorry to disappoint you. If there was such a cream out there that sheds pounds I think most of us would already be signed up for it! Fat Girl Slim is a skin firming cream. It suppose to help reduce cellulite and help tighten up your skin. Now, what does this have to do with my stretch marks? I decided to try to use this cream on both my stretch marks and below my bum where I have a bit of cellulite and to my surprise it worked in both places. I've had the cream for about a month and have been using it these last two and a half weeks and have noticed a difference, mainly by my bum. Although I've seen a difference in my stretch marks fading, I still see them, maybe if I keep using the cream the marks will eventually go away completely. On another note when using this cream my skin has become super soft, like, really soft. This I like! Fat Girl Slim is available at Sephora from now until July 2013! Disclosure: All opinions are my own. I received Fat Girl Slim 6oz. at no cost for the purpose of this review. No other compensation was received.